By the time a deal closes, many sales reps may feel that they’ve practically been joined at the hip with their buyers. What might have started as a cold call later developed into an initial meeting, then a formal pitch, then a series of follow-up meetings, calls and seemingly endless email threads before a purchase was made. Once the order has been finalized, the initial moment of celebration (even if it’s just a happy dance in your head) might be followed by the thought that this marks a bit of closure with your customer -- at least until the next time they’re ready to buy. In the Age of the Customer, sales reps shouldn’t just see a closed deal as their cue to move offstage. Especially with new customers, the rep has been their key point of contact and the biggest influence on the overall experience they’ve had with the brand. There is an art to figuring out how to hand off that relationship to others on the team, and in small and medium-sized organizations it may not be completely handed off at all. Instead, sales reps should look more holistically at the way they nurture interest from customers and pay at least as much attention to the moments after the sale has closed as they did throughout the rest of the process. That’s been a hallmark of the most successful users of Sales Cloud from the very beginning. If you’re unsure of the best etiquette around this, the following list of “dos and don’ts” can be your guide. 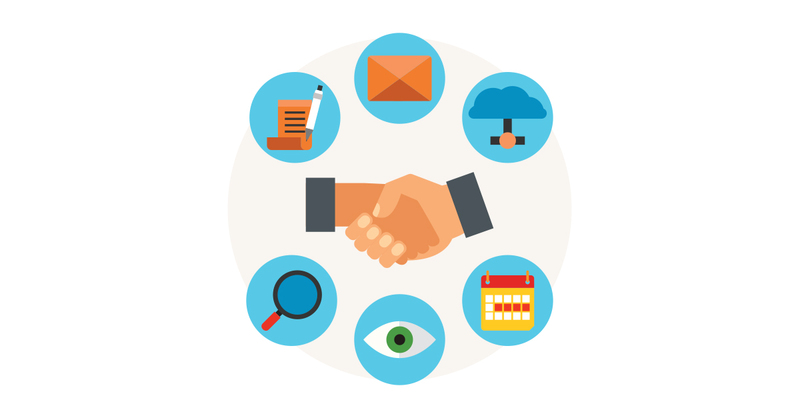 Once a customer has signed on the dotted line, what’s next? That’s an easy question for the sales rep to answer -- onto the next opportunity! For the customer though, it can be a confusing process of figuring out when they’ll get access to whatever they bought, who they’ll be dealing with, how they’ll remediate any problems and so on. Sales reps should close off any of these uncertainties, especially if the organization they work with is too small to have a formal onboarding or customer success process in place. Upselling and cross-selling is one of the biggest advantages of using tools like Sales Cloud, but CRM will also teach you a lot about the right timeline to pursue those kinds of opportunities. Generally speaking, of course, you’ll want to give it long enough that the customer will have had some degree of success with their initial purchase. They also need to be happy enough with the overall experience that you’ll have immediate credibility when you introduce an additional opportunity. Suppose you get lucky and sell your company’s newest offering to a brand-new prospect. Less than a month later, the marketing team comes out with a white paper or e-book that walks through some of the thinking behind the product, or how it can tie into common business strategies. A good sales rep will be sure to use that kind of content when they’re making their next sale. A great sales rep will take that same content and make sure the customer they’ve already sold to receives it too, and even point them to the parts that they know (based on the discussions they had before the deal closed) will resonate most within their organization. This is a way of showing you’re still interested and genuinely care about their goals, even though there’s “nothing in it” for you at that particular moment. Some buyers would rather be contacted by email. Some will want the back-and-forth of a live phone call. Some initial connections might have come through social media. If customers buy something and then never hear anything for weeks or months afterwards, sales reps will be at a disadvantage the next time they reach out via that channel. In the worst-case scenario, the customer will almost feel as though they’re being preyed upon in the communications medium of their choice. There’s a lot reps can do in those channels in the meantime, whether it’s sharing content via social, sending off a newsletter with tips or advice they’ve gotten from similar customers or just a phone briefing to keep them apprised of the firm’s next event or upcoming launch. Nothing helps confirm to hesitant prospects that they’re working with the right vendor than seeing success stories from similar organizations who have bought the same products and services in the past. In many organizations, case studies are initiated by marketing teams who get advice from their counterparts in sales about who’s already a happy customer and might be willing to be featured. Sales often plays a strong role here in coordinating the right contact within the customer, and providing the marketing team with any necessary background and context in order to make sure the story is told in the most appropriate way. The period soon after the sale is not the time to begin this process, necessarily, but if you’re keeping in touch with customers, you’re also listening and learning about what they’re going through, how what you sold them is contributing to their business outcomes and so on. That’s all key information that could give you a head start on a case study -- and even give you a better sense of the exact right moment to ask for them to participate. Customers won’t want sales reps hovering around them all year long, but if there’s a genuine attempt to develop a meaningful relationship they’ll be more likely to remain an engaged and loyal buyer over the long term. They’ll also wind up providing some of the most useful information you feed into Sales Cloud -- which of course, can lead to even more closed deals in the future.